Accepting reservations for 30 days or more. For booking or more information, please contact us. The Marigny, two blocks outside of the French Quarter. This lovely multi unit home offers two apartments available for vacation rental. Both are two bedroom apartments. The main unit of the home offers a master suite with a full private bathroom and a second bedroom with a large bathroom accessible to both the bedroom and living room. The living room opens up to the courtyard and patio. A modern kitchen situated between a large living room and formal dining room allows for great entertaining. 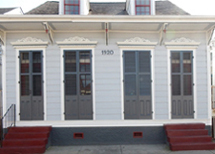 It is ideal for families visiting New Orleans or couples wanting the comforts of home for an extended stay. This large apartment has over 1500 sq. ft with 18 ft. ceilings and hardwood floors. A smaller unit approximately 800 sq. ft is ideal for families with young children. It features a one bedroom with a queen size bed, sitting room, living room and small kitchen with one bathroom. The sitting room is an extension of the bedroom and is equipped with day beds that accommodate two for sleeping. Both units can be opened to each other and made available as a 4 bedroom, 3 bath accommodating 8 – 10 pp. A great vacation or corporate rental with all the conveniences of home. 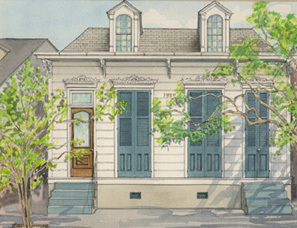 This home is centrally located, one block off Bourbon Street and walking distance to all of the French Quarter spots.